The Viet Nam Book of Records has recognised a collection of gold objects belonging to the Oc Eo – Go Thap culture as the largest of its kind in the country. HA NOI – The Viet Nam Book of Records has recognised a collection of gold objects belonging to the Oc Eo – Go Thap culture as the largest of its kind in the country. 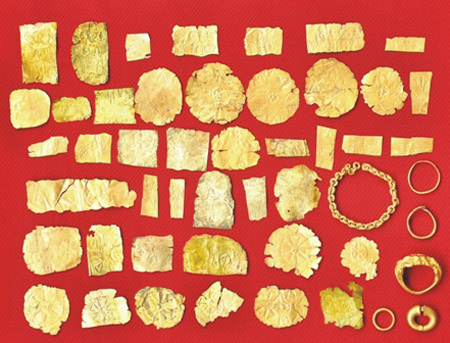 The collection comprises 49 gold objects discovered during excavations in the 1984-2013 period at the Go Thap archaeological site, Thap Muoi District, in the Cuu Long (Mekong) Delta province of Dong Thap. The antique objects date between the third century and the seventh century. Many of them represent the Hindu God Vishnu and flowers such as the lotus and water lily, as well as sacred animals such as the Nandin cow, Vahara pig and Shesha snake, besides the Kurma tortoise and Sankha snail. The rest of the collection, which includes jewellery such as rings, earrings and necklaces, also demonstrates the skills of goldsmiths of the ancient civilisation. The objects are believed to have been offerings made to heavenly beings in return for their support. The antiques are being preserved at the Dong Thap Museum. Due to its historical, archaeological and cultural value, the museum and provincial People's Committee suggested to the government that the collection should be recognised as national treasure.